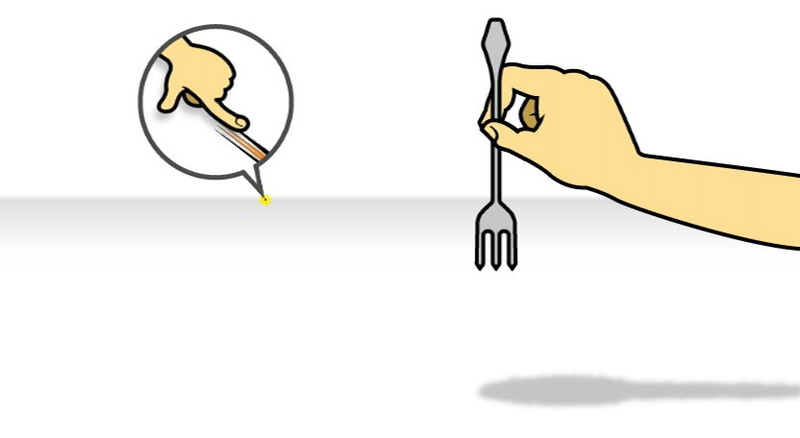 We can't think of any suitable fork jokes. At last week's Nintendo press event in the Netherlands, we played several games, but one which has oddly not seen much coverage around the web yet is the latest entry in the Rhythm Heaven series. Scheduled for release in Japan next week, the demo Nintendo had on offer was completely untouched by translators, and was thus completely in Japanese. However, this is Rhythm Heaven we're talking about, so the gameplay is so simple and straightforward that you don't need to understand any text for it to click. The demo had a selection of three games from the final build on offer, all of which have been seen in trailers and screenshots already released. The first of the three, which we were recommended to start with, was naturally the easiest. All we did was control a hand holding a fork, attempting to stab several peas as they were shot across the white surface we could only assume was a table. Will this poor samurai ever win? 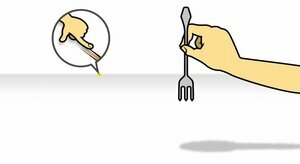 Getting it right puts the peas on the fork dead centre, while being slightly off means they move off to the left or right a little bit. The game tried to trick us by throwing a couple of sets of high-speed triple peas at us, but in the end we managed to score a perfect rating. The second game starred the familiar samurai character from the previous games, still caught in an endless struggle with the strange black tengu mask-wearing creatures he's fought before. This time, we had to make him slash up the creatures as they jumped out of a black void, to prevent him from being attacked. We were also attacked by an entire group of smaller demons a few times, requiring us to hit the A button multiple times quickly to do a wild spin attack, but the real hilarity started later as the screen started getting covered with inspiring images of the things the samurai was fighting for, like happy children, almost completely obscuring all the action that was going on. The screen even went completely black for a while, requiring us to use only the sound to guide us, but we still nailed a perfect score. The third game was perhaps the most well-known one from media of the game thus far, as it involves a dog and cat playing tennis while flying planes. We didn't think this one would be too hard before, but the demo convinced us otherwise: this game requires you to keep pretty much a constant tempo going, with a ton of speed changes and other things to throw you off guard. A thick mess of clouds came up and blocked our vision, much like in the previous game, and the cat in the other plane frequently flew further into the distance before coming back, making the ball travel much longer distances and making it much faster. We're sure the people living below didn't like it, but we missed many of the balls once this started happening, and only just managed to get a pass. 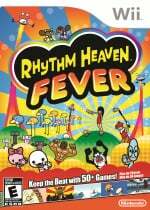 Although three games is most likely just a microscopic amount of content in the final game, we were already sold on the latest Rhythm Heaven by this demo. It might seem like the franchise is better suited to handhelds, but trust us, the Wii game works every bit as well. With the same simple gameplay, simplistic, stylish look, catchy music and many of the same quirky characters, we're certain that this'll match up to the other games once it hits store shelves later this year (North America) or early next year (Europe). Sounds awesome, can't wait. I'm so glad they decided against motion controls. Can't wait for this game either. I hope they'll have good multiplayer modes in there since that would be a perfect fit for the Wii. This is my most anticipated game of Nintendo's lineup. I will unbox my wii for this game, and I'm happy it's all buttons. I'm seriously tempted to get a Japanese Wii for this game. It will likely be the last Wii game I buy anyway. I can't wait to get this.I'm glad those chose to use buttons instead of motion controls. Sounds fun, but I sure hope this is not $50. 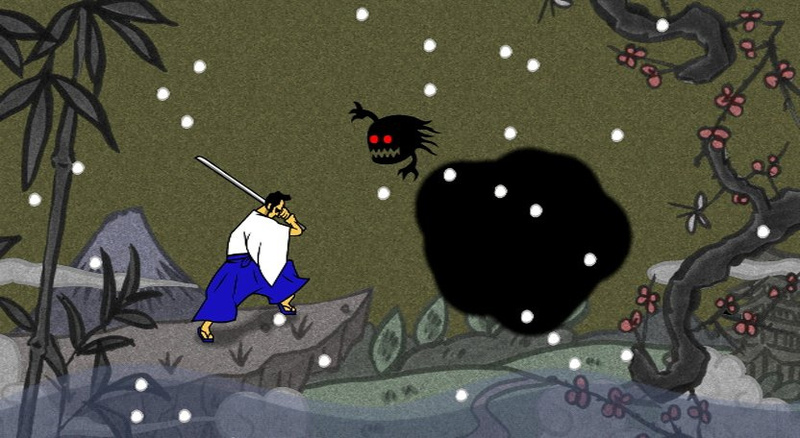 Played this at E3... that part where your view of the samurai is clouded with memories and other visions is hilarious. Awesome music, too. Can't wait. I've only played the DS version before this. Is the GBA game worth importing, if you've already devoured the DS one? LittleIrves - i believe the GBA one was far superior in manyways because the lack of stylus means only button pressing and its more accurate and you get less frustrated wondering if the touchscreen picked up your movements vs wondering if you did it wrong. with the buttons, you know if you got it or not. you should look it up on youtube i loved it and if it only came with the drum session part, i would still recommend it. the music was really catchy too. the baseball one will forever beat in my brain.. if this video doesnt sell you , then you shouldnt even be thinking of the wii version haha..
Get the GBA import. Its the best! Although they may be wrong. @mushroomer that looks cool! Are you sure that's GBA? I'm sure the $50 price tag comes with more Rhythm Games. I was thinking on getting this before Kirby Wii. It seems like a musical Warioware. 40 dollars would be a great starting price for it. The DS game was aces! I don't know if I'll get this straight away though. "or early next year (Europe)"
So this one has been shoved to next year? A pity, but it can't be helped. Looking forward to it all the same! @14: Alright, I've never played Rhythm Tengoku, but personally, I think Rhythm Tengoku Gold is better. The controls are more unique and they aren't inaccurate, if you have issues with them, it's your own fault. I never have any problems with them. Additionally, I find the games better, as they are based less around language. With exception for Fan Club, all Rhythm clues are based around sound, as opposed to Tengoku, in which a lot games use lyrics as cues. But then again, maybe everyone thinks Tengoku is better because it's japan only and uses buttons.